Are you interested in something special for the bride to be? A small diamond cross pendant not only is the perfect compliment to a wedding dress but it is a gift that has special meaning and style. Bridal jewelry comes in a range of styles from the most simple to extravagant. If you are looking for a simple piece that not only is sentimental but will be a beautiful accent, a diamond cross pendant may be your answer. When shopping for bridal jewelry, you will not want anything that will distract from your gown or be overpowering. Crosses are appropriate to wear for any occasion and have a spiritual meaning for whoever wears one. A cross pendant can be given to the bride to be as well as to members of the bridal party or anyone else involved in the wedding as well. This type of pendant also makes a special gift for an anniversary or engagement and will instantly make the recipient know how much you care. A diamond cross is a timeless piece that a woman can wear for many occasions and will be a great addition to any jewelry collection. 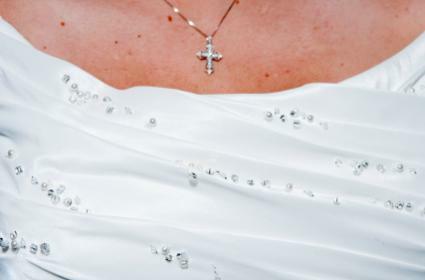 A small diamond cross pendant is a great option for any bride to consider wearing on her special day. If you are looking for something subtle that will provide a hint of sparkle, this may be an option for you to consider. For those who are looking for a gift for that someone special, a diamond pendant of any sort is always an appropriate gesture. Cross pendants can be found in a range of sizes and in metals, such as white gold, yellow gold, sterling silver and platinum. They are often done with diamond accents and can consist of diamonds as the only stone or diamonds mixed with other gemstones like sapphires, rubies or emeralds. A gift from the popular Tiffany & Co. will be treasured for years. Whether you are looking for an engagement gift or something special for the bride, consider the Tiffany Cross Pendant. The pendant is set in platinum and is accented with round brilliant diamonds. The Diamond Fashion Cross Pendant, found at Littman Jewelers, is simple yet elegant. It comes in either white or yellow gold and features a small cross with three round diamonds set diagonally along the center of the cross. A cable chain is included. Blue Nile offers the Diamond Cross Pendant in 18k white gold. It has eleven diamonds that weigh a total of 1/2 carat and will sparkle for any occasion. Heavenly Treasure's diamond cross pendants celebrate love and faith in romantic designs. The 14k White Gold Diamond Heart and Cross Pendant features a heart wrapped around a diamond accented cross. This elegant piece will compliment most wedding gowns whether tailored or ornate. The Adorable 18k White Gold Diamond Cross Pendant is small and done in a classic style for brides who like dainty designs. Since cross pendants come in a range of styles, it is easy to find the one that will best suit the woman in your life. Whether you decide to browse the selection at your local jewelry store or visit a site online, there are plenty of styles to choose from. This type of pendant reflects spirituality and is suited for a wedding or anniversary gift since it conveys special meaning for whoever receives one as a gift.